This post is sponsored by Celestial Seasonings. As always, all opinions expressed here are my own. Thank you for supporting the brands and companies that help make Pumpkin ‘N Spice possible! This Blueberry Gingerbread Loaf is soft, moist, and loaded with fresh blueberries and cozy spices. 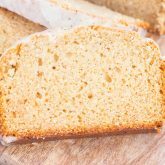 Easy to make and bursting with the flavors of the season, this bread makes a delicious breakfast or dessert for your hungry house guests! There’s just something about the flavor of gingerbread and a hot cup of tea that makes me feel all warm and cozy. It’s the essence of the holiday season, and tea and gingerbread go so well together! I’ve shared before that gingerbread cookies reminds me of my Grandma, as she always made them every Christmas. My brothers, cousins and I would always get together to decorate the finished cookies, and it still holds a very special place in my heart. But a gingerbread loaf? That’s something that I’ve never had before, up until recently, that is. And you all know how much I adore blueberries, so it was practically a no-brainer for me to add them into this Blueberry Gingerbread Loaf. But, I can’t take all of the credit. I was inspired to create this sweet treat from my love of hoarding magazines, specifically Better Homes and Gardens Fall Baking edition. And you know what goes perfectly with this Blueberry Gingerbread Loaf? 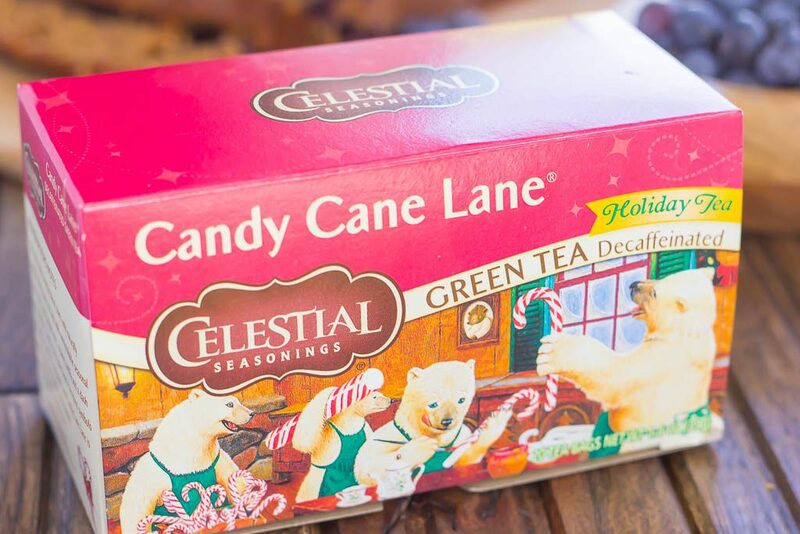 Celestial Seasonings Candy Cane Lane Green Tea. I know that it probably sounds a bit strange to pair peppermint tea with a gingerbread loaf, but trust me, it’s a winning combination. Celestial Seasonings holiday blend is filled with naturally decaffeinated green tea, peppermint, vanilla, and a dash of cinnamon.”The Magic of Tea” is what the holidays are all about. And the minty flavors complement the coziness of the Blueberry Gingerbread Loaf. I mean, what could be better than a slice (or three) of this bread, along with a steaming mug of tea for breakfast or dessert to warm you up on a chilly winter day? Like most of my recipes, this loaf is a breeze to whip up. With just about 10 minutes of prep time, you can have this dish ready to be devoured in less than an hour. And anything that is ready in less than an hour is a winner in my book! 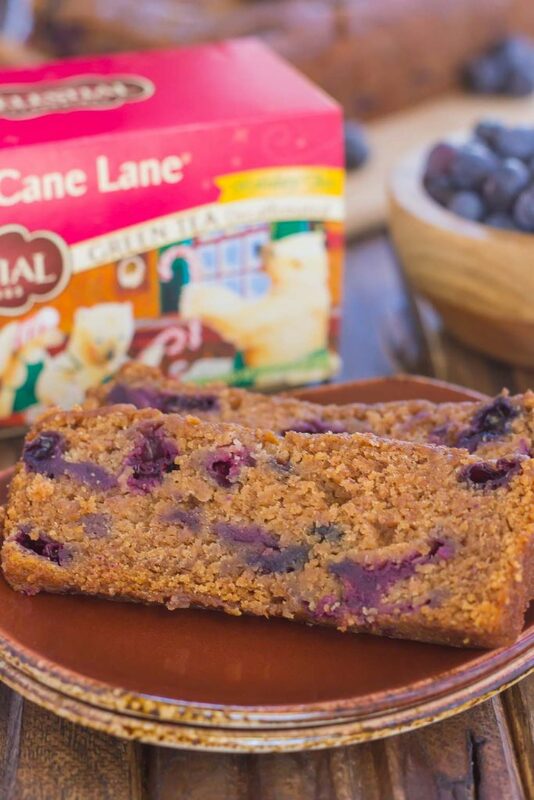 So grab a slice of this Blueberry Gingerbread Loaf, a hot cup of Celestial Seasonings Candy Cane Lane Green Tea, and enjoy the warmth of the holiday season! Looking for more gingerbread recipes? I’ve got you covered! Preheat oven to 350F. Lightly spray a 9x5 inch loaf pan with non-stick cooking spray. Set aside. In a medium bowl, whisk together the flour, cinnamon, ginger, salt and cloves. Set aside. In a large bowl, beat the softened butter with an electric hand mixer or stand mixer with fitted paddle attachment for about 30 seconds. Slowly add the white and brown sugar, beating util combined. Set aside. In a small bowl, stir together the applesauce and baking soda. Add applesauce mixture to sugar mixture, beating until combined. Slowly add in flour mixture until just combined. In a small bowl, toss blueberries with flour. Gently fold into batter until combined. Cool for 10 minutes in pan, then remove loaf from pan and cool completely on a wire rack. I love these teas! 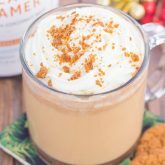 I bought the the seasonal sampler and I'm currently sipping on the gingerbread spice as I type! The peppermint candy cane is my favorite post-dinner beverage. Now I just need to make some blueberry gingerbread to have on the side! The gingerbread spice one sounds delicious, too...I'll have to try that! Thanks for the kind words, Blair! Thanks, Megan! Blueberries and gingerbread make such a delicious combo! Memories are such a wonderful thing. Funny how something so simple has such an impact and sticks with you like baking gingerbread and your grandma. So sweet. This brand of tea is delicious! 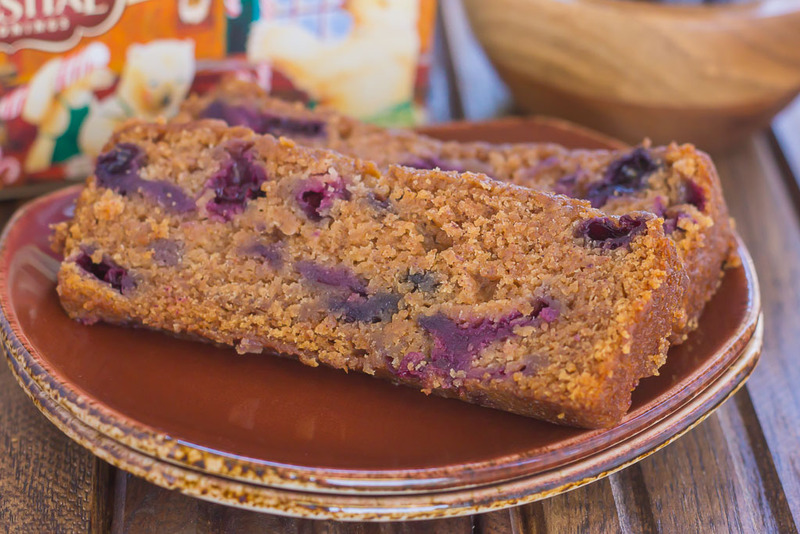 I never would have thought to put the combination of gingerbread and blueberries together, but it sounds wonderful! Plus, it looks super moist! I've done a bunch of holiday baking this past weekend and still some more to go. I'm going to have to add this one to my list :) Pinned, of course! Happy Monday! Yes! Memories are so wonderful and I love looking back, especially over the holidays. Gingerbread and blueberries sound a bit strange, but it really is so good! Thanks for the kind words and pin, friend! 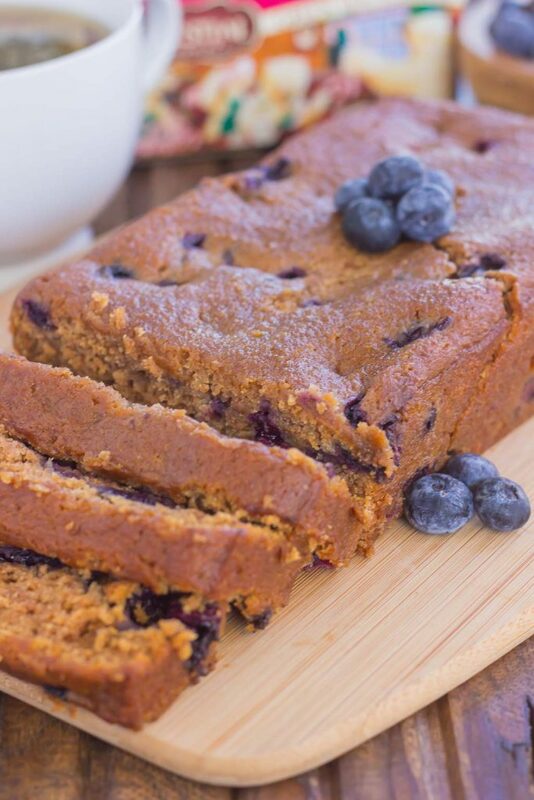 Gingerbread and blueberries sounds like the most amazing combo EVER, Gayle! This loaf is seriously so pretty and I totally want a few slices with my coffee right now! A slice of this loaf and coffee sounds perfect to me, too. Thanks, Sarah! Blueberries and gingerbread sounds wonderful! I'd love a piece (or two) with my morning cup of coffee! Wahooooo to adding Celestial Tea to EVERYTHING holiday related!!! I am drooling over this bread, Gayle! I love me some gingerbread, and the Candy Cane Lane Green Tea sounds like a delicious addition (I don't think it sounds weird at ALL.). Plus you added blueberries!? Hold the phone, this bread rocks the dang house! I wish I had a loaf of this for breakfast! Pinned of course! Cheers! Gayle! I agree!!! I want a big slice of this Blueberry Gingerbread Loaf AND a hot cup of Celestial Seasonings Candy Cane Lane Green Tea!!!! yum! and I love the blueberry + ginger + cinnamon combination! Thanks for the sweet comment, Alice! 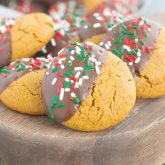 I love that gingerbread cookies reminds you of your grandma, such a special memory. I'm a huge green tea fan and totally going to check out this Candy Cane version next time. A slice of this yummy gingerbread loaf sounds perfect to go along with it! I loooooove Celestial Seasonings tea! I gave up coffee a few years back and tea has become my major addiction, mostly because I love trying new flavors. I have way too much of it, haha! This blueberry gingerbread loaf looks like the perfect thing to pair with a cup of tea :) it looks so moist and incredibly delicious! I love trying new tea flavors too, especially seasonal ones! Thanks for the gingerbread love, Rachel! Thanks for the sweet comment and pin, Demeter! Gingerbread loaf and tea sounds perfect for this afternoon, too! Thanks, Ashley! It makes the perfect combo! I have got to pick up these holiday teas! I keep seeing them pop up here and there and they all sound so delicious. I have a feeling this one will be my favorite, since I love all things peppermint. I love that you added blueberries and I think this loaf alongside that tea sounds just perfect, Gayle! 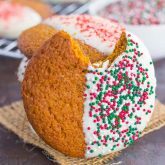 It's not the holidays for me without gingerbread, and I love it in cookies, waffles, and loaf form! I've never thought to add blueberries, and this is a great idea! A slice of this loaf with tea would be the perfect evening treat! I agree, Marcie! Gingerbread is great in just about everything. Thanks for the kind words! What a lovely bread and that tea flavor sound so good! I need to check it out! Thanks for the kind words, Natalia! Blueberries make this extra special. I'll take gingerbread in any form! This loaf sounds so good, Gayle! A big slice of this with a warm mug of tea? Perfect! 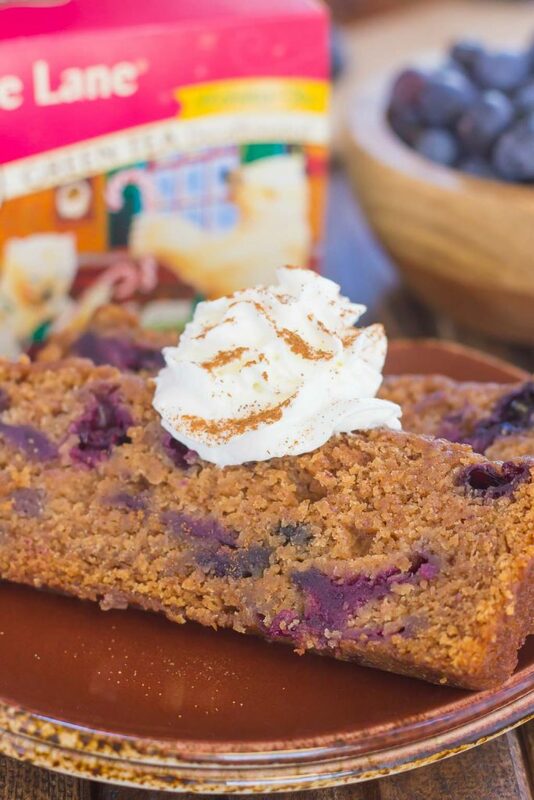 Love that you combined blueberries with gingerbread! Wish I had a slice to go with my coffee! Oh yes. Gingerbread,I already taste one before but this one is different! I say,more delicious and a cup of tea add a bonus.Yummy!